So this has been the week containing the first few days back at school after the Easter break, and I have to say that I’m not loving it. We returned on Wednesday, and by Friday I was sick of school again. Honestly, I’m very thankful that I live in Norway and have had the possibilities in education that I’ve had, but I am really looking forward to being done. Anyway, I won’t make this post about complaining about the fact that I have to go to school. Let’s instead start out with some of this weeks pictures. 1, 2 & 3. I’ve been doing a lot of maths, with different accessories and in different locations. On Tuesday I took advantage of the fact that I didn’t have class and met up with one of my friends. We went in to town and went for a hike in the beautiful spring weather. Which by the way, was pretty damn good! During our hike the temperature hit 16 degrees, and we were both only in tshirts. It was this year’s first taste of summer. Later that night I spent an hour and a half in a Jacuzzi with my best friend, just talking about school and our futures and everything between heaven and earth. Friends that you can share all your worries with are the best. If you have some of those, do your best to keep them! Thursday brought with it a completely new aspect to my life: the russetid. Basically Norway’s seniors spend the month leading up to the independence day (17th of May) partying, wearing bright overalls and daring each other to do riddiculous things and showing these things off by tying things to their hats. Like this. It formally doesn’t start until the 16th (when everyone wears their overalls the wrong way out before turning them on the 17th), but one of these dares was to go for a swim in the ocean before the 10th of April. Guess I completed that one. 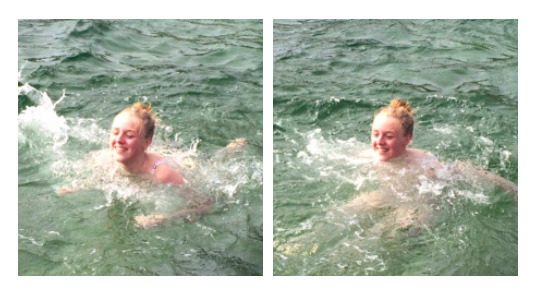 It as absolutely hellishly cold and I would not recommend swimming in 5 degrees sea-water. However, I now have the privilege of tying a gold popsicle stick to my hat. Another ruse thing that happened this week was the continued working on my overalls, as you can see in the picture above. Most people iron on a lot of images and things, but I’ve been busy with sowing on lace and ribbon. If you guys want to see it when it’s finished, let me know! And that is what has been happening this week. How has you guys’ week been?